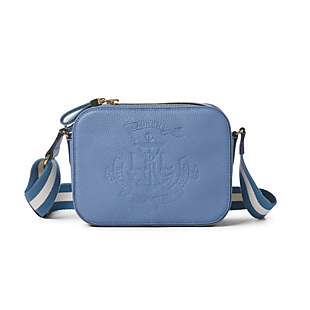 This Anchor Leather Camera Bag, originally $178, drops from $134.99 to $94.49 in the pictured Blue Mist, and from $144.99 to $101.49 in Navy or Sunflower when you apply promo code FAMILY at RalphLauren.com. With free shipping on all orders, these are the lowest prices we could find. 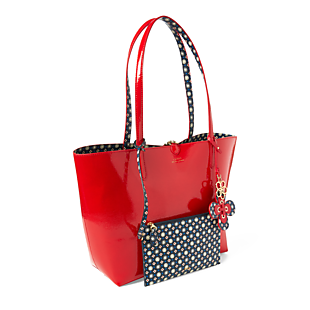 This bag measures 6"x 8"x 3" and has an adjustable crossbody strap with a maximum 21" drop. Sales tax is charged in most states. This Saffiano Leather Mini Satchel, originally $238, goes from $189.99 to $132.49 in Black or from $184.99 to $129.49 in Lauren Tan (pictured) and Navy when you use promo code FAMILY at checkout at RalphLauren.com. With free shipping, this is the lowest price we could find for this bag. Sales tax is charged in most states. 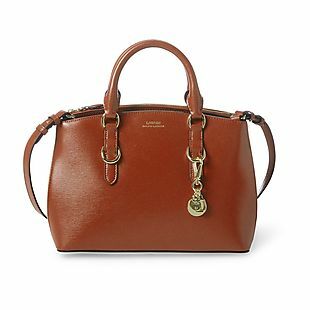 This Lauren Faux-Leather Reversible Tote, originally $178, drops from $104.99 to $73.49 when you apply promo code FAMILY at RalphLauren.com. That's almost 60% off and the lowest price we could find. Choose red or blue. A matching pouch is included. Shipping is free. Sales tax is charged in most states. 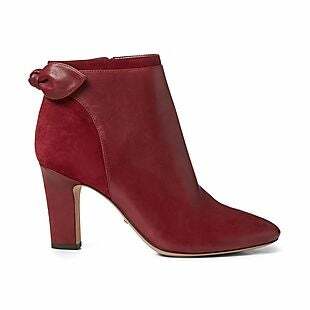 These Breanne Leather and Suede Booties in three colors, originally $165, go from $99.99 to $69.99 when you enter promo code FAMILY at checkout at RalphLauren.com. With free shipping, this is the lowest price we could find for these shoes. Sales tax is charged in most states. 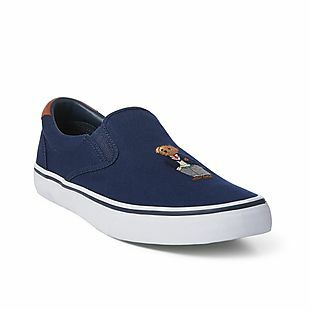 These men's Thompson Polo Bear Slip-On Shoes, originally $75, go from $39.99 to $27.99 in limited sizes when you use promo code FAMILY at checkout at RalphLauren.com. In a larger range of sizes, the same style goes from $49.99 to $34.99 with the same code. With free shipping on all orders, these are the lowest prices we could find. Sales tax is charged in most states. 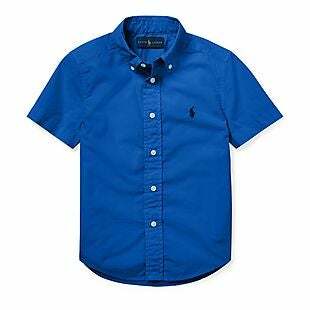 This Cotton Poplin Short-Sleeve Shirt at RalphLauren.com goes from $35 to $25.99 to $18.19 in toddler and little boys' sizes when you enter code FAMILY at checkout, or from $39.50 to $29.99 to $20.99 in big boys' sizes with the same code. With free shipping on all orders, these are the lowest prices we could find. Choose New Iris Blue (pictured), Hammond Blue, or White. Sales tax is charged in most states. Shop the Friends and Family Sale at RalphLauren.com and use promo code FAMILY to take 30% off full-price and sale styles. 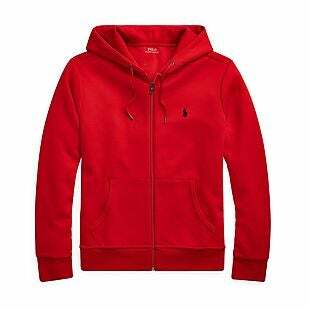 The pictured men's Polo Double-Knit Full-Zip Hoodie, originally $98, goes from $69.99 to $48.99 in red, white, or grey, and from $98 to $68.95 in olive with the promo code. And check out the women's Hermione Leather Booties, originally $165, now going from $99.99 to $69.99 with code FAMILY. Shipping is free on all orders. Sales tax is charged in most states. 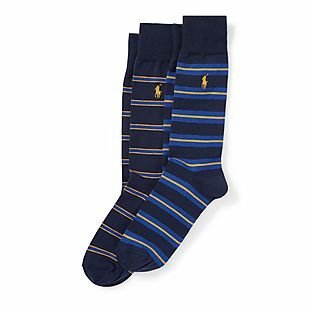 A variety of men's socks in single and multi-packs are on sale now at RalphLauren.com. The pictured Striped Trouser Sock 2-Pack, originally $18, drops from $9.99 to $6.99 when you add promo code FAMILY at checkout. With free shipping on all orders, this is the lowest price we could find. Sales tax is charged in most states.